Caring Money Management. Structure. The right support to achieve your goals. Free personal budget and money plan. Ensures you have enough to pay your bills on time, put money into savings and live the life you want. It’s hard trying to do it yourself. We can help you stay on track by managing your budget on your behalf so you have no more money worries. We give you the visibility, structure and support from our caring staff to help you make the right financial decisions. Whether you're trying to pay off debt or save, we can help. Click on the tab that describes your situation and we'll show you how we can help. There are many ways to consolidate debt. Understand your options and make the right decision. We can deal with debt collectors and creditors for you. With the right debt strategy in place, you may repair your credit rating over time. Getting out of debt can be less painful than you think. We'll show you how. Reduce your reliance on the plastic and start paying off your debt. We can help you take control of your money and start saving. We’re different than anything you’ve tried before. Hear why our clients are so successful. 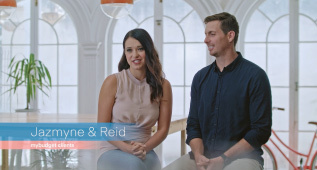 Jaz and Reid are living the life they want and have more savings than they ever did before. 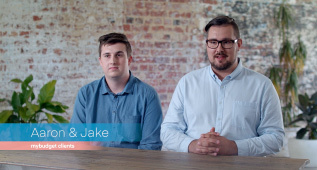 Aaron & Jake are on their way to a life free of debt! 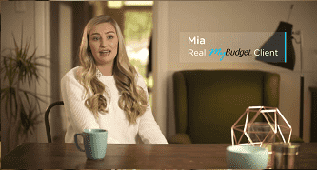 Mia joined MyBudget and paid off $25,000 worth of credit card debt in just two years.